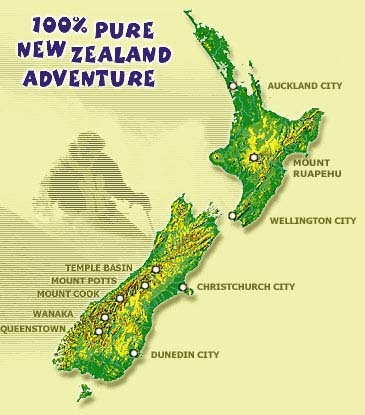 New Zealand Adventure Specialists : Vacation packages, guided tours, ski tours, ski vacations, heli skiing, snowboarding, snow reports and ski conditions, golf, hunting, mountaineering, climbing, trekking (including the Tongariro Alpine Crossing), trout fishing, honeymoon vacations, accommodation, travel insurance, information on New Zealand and much more. TONGARIRO GUIDED TREK and ALPINE CROSSING : New Zealand's Tongariro National Park offers spectacular volcanic scenery. Experience the majestic beauty of one of the world's most dramatic parks. The Tongariro Alpine Crossing is an enjoyable day walk. Other guided treks include the Mt Ruapehu Crater Lake and the Tama Lakes. And after each day's walk, you'll return to the comfort of New Zealand's most luxuriously elegant hotel - the Bayview Chateau Tongariro. HELI SKI : Welcome to New Zealand one of the best heliskiing regions in the world. Heli skiing at Queenstown, Wanaka, Mount Cook and Methven is definitely the ultimate New Zealand heli ski experence; and you don't have to be an expert to enjoy it. The snow powder is usually deep and the ski locations are breathtaking. The New Zealand heli skiing season generally operates from 1st July to 30th September. NZ SNOW SAFETY INSTITUTE : The New Zealand Snow Safety Institute runs a series of courses throughout the winter on avalanche awareness, climbing, mountaineering and backcountry skiing and snowboarding. The courses are designed for people new to the mountain environment or those wanting to improve their skills. TEMPLE BASIN SKI AREA : Temple Basin Ski Area offers budget student and family skiing and snowboarding on some of the best snow powder and skiing terrain that New Zealand has to offer. Great terrain that covers everything from beginners to daredevil stuff. Brilliant upper slopes. Avalanche Safety Equipment : Get yourself ready for the Ski Season with the right equipment. We sell a range of Avalanche Safety Gear from Avalanche Transceivers, ABS Air Bags, Snow Shovels, Snow Probes, Ice Axe, Crampons, Snow Science equipment and much more. Leisure Travel Insurance designed for the overseas tourist traveling to Australia, New Zealand and Worldwide. This insurance provides comprehensive travel insurance cover and extended benefits including rental vehicle excess, emergency baggage, travel delay and missed connections. Business Travel Insurance is also available.